Information: David "Dave" Rosenberg, teacher of international folk dance. Dave was co-founder, with Michael Herman, of the Folk Dancer record label. Several hundred excellent folk and contra dance recordings were produced. The collection were available on CD through The Kentucky Dance Foundation. He was born in Roxbury, Massachusetts, on July 5, 1915, and spent his early years in Winthrop, Massachusetts, where as a Boy Scout he attained the highest rank of Eagle Scout with Palm. After apprenticeship as a church decorator, he became a protrait painter and commercial artist. In World War II, he worked for the Massachusetts Institute of Technology Radiation Laboratory as a scientific illustrator and later enlisted in the United States Navy with the Atlantic fleet. In 1945, he was transferred to Washington D.C. as art director of All Hands magazine, the Navy's official publication. Then, in 1960, as part of the Navy's "People to People Program," he became the first director of "overseasmanship" training for Naval personnel, a position he held until his retirement in 1994. His work included predeployment indroctrination to personnel and families of all ships, stations, United States. Marines, United States Naval Academy, Merchant Marine Academy, and foreign navies visiting the United States. As well as lecturing in the United States, on board ships, and at bases in other countries, he prepared a series of closed-circuit video tapes on "how to get along overseas" with emphasis on appreciating the customs and cultures of peoples around the world. During his long career as teacher for the Navy, he received several Outstanding Civilian Service awards. In addition to his work with the United States Navy personnel, Dave was active as a leader in traditional international folk culture activities. Through the District of Columbia Recreation Department, he taught the Washington Folk Dance Group and founded and directed the National Capital Area Folk Festival of All Nations. He also served on the Board of the Northern Virginia Folk Festival Association. He was chairman of cultural programs for the President's Christmas Pageant of Peace (first held in 1954) and contributed to the Smithsonian's Folk Life Festivals, being deeply involved in the Austrian and German programs. As a folk dance teacher, he taught at schools, universities, and recreation groups in cities around the United States, including the 1960 Santa Barbara Folk Dance Conference. Dave was also active with the Sister Cities International program for many years and participated in its annual conferences. An example of his wide-ranging skills and interests was his membership in the International Brotherhood of Magicians, Order of Merlin. 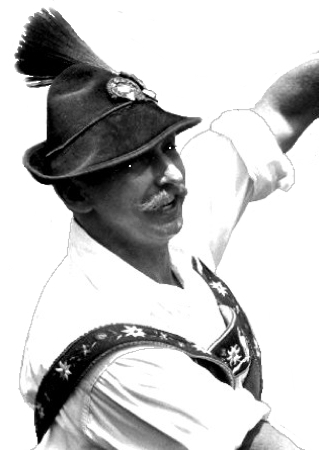 He was lead dancer and director of the internationally known Alt Washingtonia Schuhplattler Verein (Original Bavarian Dance Group of Washington), which continues to present programs of authentic Alpine music and dance throughout the greater Washington area, and he was a founder of the federation of shuhplattler clubs, the Gauverband Nord-Amerika. For his contributions in preserving and sharing German folk culture, he was awarded the Officer's Distinguished Service Award from the German government. Dave died on February 22, 2005, at the Hermitage in Northern Virginia, of complications following kidney failure. Burial was at National Memorial Park. He was 89. His wife, Nancy (Kane), also lived at the Hermitage. He had three children, Phyllis Blum, Jean Diamond, and Karl J. Rosenberg. Folk Dancing with Dave Rosenberg. November 1959 (Self published). Folk Dancer Record Service, a recording compmany.